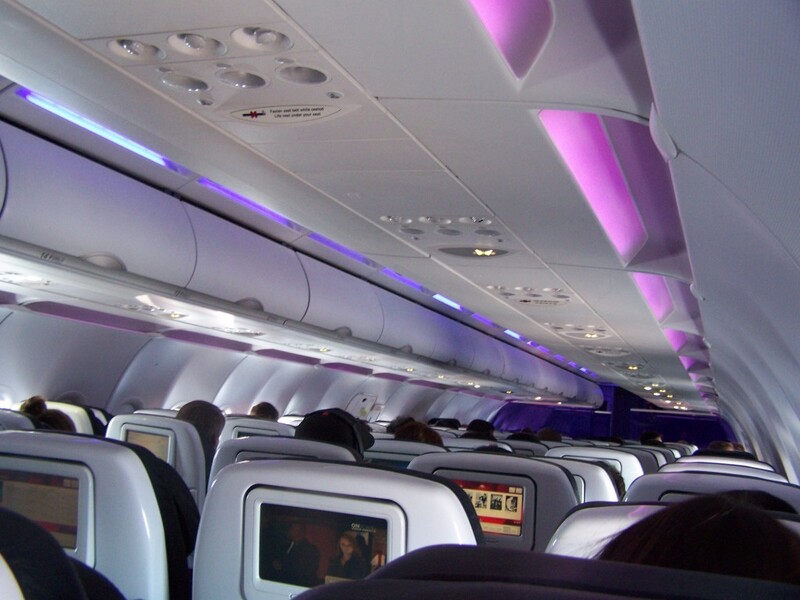 Funky purple lighting is just one thing I love about my new favorite airline. I could see the purple glow before I even got close to the door of the plane. Oh, sweet Virgin America airplane. How I have waited for you. Slowly, slowly, we crawled in our line to the cabin door. Sparkles!! The exterior of the airplane is glittery white! I crossed into the cabin, surveying the plane. First class looked normal enough. Except the front and the back of the section had thick purple-tinted plastic to make up a wall. And, the seats. They sure did look nice, all black and leathery and big. I continued walking through the main cabin section and came to my seat. 17F. A window. Abby and I had selected seats at the same time. She wanted an aisle. Me, a window. Neither of us had bothered to see if the middle seat was taken when we checked-in the day before. We grumbled for a moment. And I am pretty sure I rolled my eyes when the person in the middle seat simply swooshed her legs to one side and expected me to climb over her. It’s economy seating. There is no way I can squeeze between you, your legs and the seat. I digress. Back to the airplane. I sunk into the surprisingly cushion-y chair, resting my head in the adjustable headrest. I kicked my feet under the chair ahead. I swear, there’s more stretch space than normal. Then, I turned my attention to the screen embedded into the white space-age looking seat back in front of me. Oh hello, I’ve heard stories about you, sweet screen. Like Homer at the Springfield Power Plant, I begin to push all of the little buttons on the touchscreen. On Demand movies! Foreign Films! Satellite TV! On Demand TV! 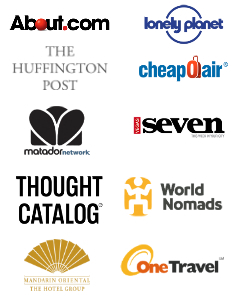 I am in airplane traveler heaven. It’s not like I am not a seasoned flyer. It’s just that my normal trips don’t have the perks this quick flight to San Francisco had. In fact, most of my international flight can’t even hold a flame to the amenities this Virgin America plan was offering. After my excitement waned with the multiple viewing options, I began to poke around the other selections available. E-mail. Chat. Yes. Chat. I pulled up the little screen and it showed the airplane seating chart. I can type a message and have it go into the Airplane Chat Room. Seriously? My mind reverted back to my teenage days, when unbeknown to our parents, my friends and I would hit up chat rooms to stir trouble. I don’t suggest it on a Virgin flight, but still. The rumors are true. Seat-to-seat chat. I can send a message to another passenger. Instead, I chose to harass Abby. I pulled up the screen to type her a message, expecting a keyboard to pop-up on the screen. We are such an iPhone generation. Nothing. Instead, an illustration told me to pick up the remote tucked into the arm of my seat. On the backside was a keyboard. A keyboard/remote. I quickly typed “so cool,” and then I was off to the next part of my exploration on my personal entertainment device. There’s music. Music videos. Radio stations. There’s games. There’s food and drink selections. There’s shopping. This little touch screen has it all. I sat back in my seat, looked out the window at the Las Vegas skyline from the McCarran runway. I smiled. Abby and I were heading to San Francisco and Napa Valley for a Travel Blogger Girlie Weekend with Kristin. The idea was born quickly a few weeks ago, and within 24 hours after our initial discussion, tickets were purchased, hotels were secured, wineries were contacted. We were ready to get down to business. Whatever that means. And my favorite new airline was going to get us there. I remember the first time I flew VA, it is something special and definitely my favorite domestic airline! My faaaavorite airline. I fly them wherever they go, whenever I can–coolest flight attendants, best ambiance and most legroom, no question about it! It seriously is my new favorite. I wish I could fly them to work everyday. I want to come next time! Yes. You should!! Me, you, Abby and Erica. This sounds like my kind of plane! I LOVE the idea of anonymously harassing fellow passengers via an Airplane Chat Room – of course, it might not work if a seat number pops up with the message! Seriously, more airlines need to implement this. You sound like me flying, too – I’m all about the gadgets. I need it to distract me from my constant fear that the plane is just going to, you know, fall out of the sky. Eek! The seat number does come up. 🙂 Such a cool experience!! Muuuuuuh! I want to go to Napa. Shaun doesn’t drink so I have to find my own motley crew to go with. I’m still looking forward to the day that I’m on a Virgin airplane – IT LOOKS SO AWESOME. It is such a cool feature!! The technology on these flights just keeps getting more and more impressive. Never flown this airline before, but it sounds like a comfy ride (at least as comfy as possible in economy seating). So nice. I wish I could fly it all of the time! Ha!! Love that comment! You know, this flight was cheaper than Southwest, which is the reason I wanted to book it. Along with the fact that I really wanted to have my first time on a Virgin flight sooner than later. I think, if you do some searching, you can find some competitive tickets.